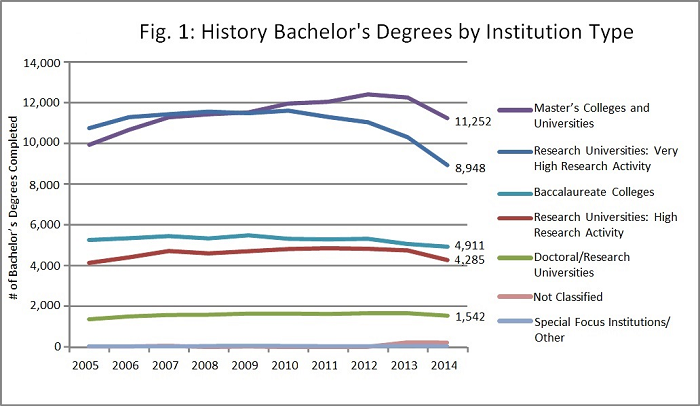 In the most recent issue of the American Historical Association’s Perspectives on History, Julia Brookins described some disturbing findings on the latest trends in the number of history degrees in higher education. Using data from the National Center for Education Statistics, Brookins asserts that the large drop in history baccalaureate degrees earned last academic year is part of a downward trend that will continue through the decade. The institution types listed above are based on the Carnegie classification system – for example, the University of Kentucky and the University of Louisville are classified as “Research Universities: Very High Research Activity.” This is the group of universities, nationally, that saw the deepest drop in history bachelor’s degrees. In Kentucky, according to the Kentucky Council on Postsecondary Education’s data profiles (baccalaureate degrees by institution and major start on page 91), the drop over time has been happening since 2008 for our research institutions, while the public comprehensive institutions are generally doing well, with Northern Kentucky University offering a huge increase in history degree production. Overall, the public comprehensive institutions have kept our history bachelor’s degree production on the increase in Kentucky.